ATHENS, Ala. – Dillon Falardeau of Hixson, Tennessee, won the Bass Pro Shops Open Series East Tennessee event held on Lake Chickamauga on 2/16/19. Running out of the Dayton Boat Dock access area in Dayton, TN, Falardeau weighed in a five bass limit totaling 23.83-pounds. His limit was anchored by a bass weighing 7.11-pounds which was the biggest bass weighed in by a boater. For the win and big bass Falardeau took home $2100.00. 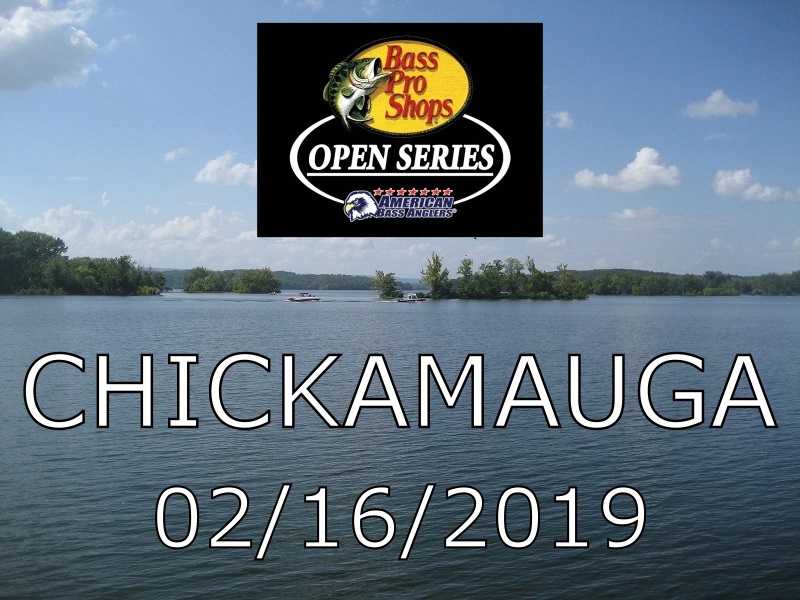 ATHENS, Ala. – The East Tennessee Division of the Bass Pro Shops Open Series presented by American Bass Anglers will hold its season opener on February 16, 2019, on Lake Chickamauga in Dayton, Tennessee. 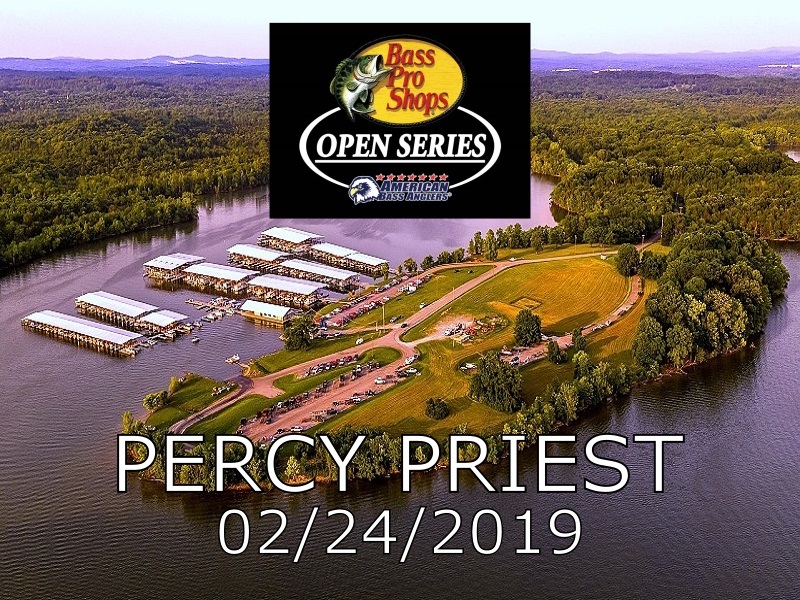 ATHENS, Ala. – The Central Tennessee Division of the 2019 Bass Pro Shops Open Series operated by American Bass Anglers will open the season on February 24, 2019 on Percy Priest Lake in Mt. Juliet, TN. The competitors will launch at Fate Sanders Ramp located at 3157 Weakley Lane, Mt. Juliet, TN 37122. Registration begins at 4 p.m. local time at with the tournament briefing to begin at Fate Sanders Ramp at 6:30 p.m. Friday evening. Dale Pelfrey of Rockwood, Tennessee won the American Bass Anglers Ram Truck Open Series TN East tournament, held August 20, 2016 on Chickamauga. Running out of Dayton Boat Dock in Dayton, Tennessee, Pelfrey caught five bass weighing 21.63 pounds. He anchored his bag with a 5.73-pound kicker. He took home $5,000 for his victory, $500 from Mercury contingency, $500 from Triton Gold, and a new Simms Challenger rain suit valued at $400. 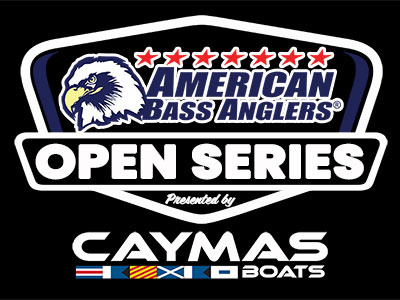 ATHENS, Ala. – The Ram Truck Open Series will hold its next event of the season on August 20, 2016, on Lake Chickamauga in Dayton, Tennessee. The competitors will launch at Dayton Boat Dock located in Dayton, Tennessee. Anglers may begin fishing at 6:45 a.m. or safe light. The weigh-in will begin at 3 p.m. Registration begins at 4 p.m. at the tournament trailer at Dayton Boat Dock. To register for this tournament, see Kristin Malott. Norm Attaway of Clearwater, South Carolina won the American Bass Anglers Ram Truck Open Series on Lake Chickamauga. Running out of Dayton Boat Dock and Grill in Dayton, Tennessee, Attaway caught five bass weighing 23.71 pounds with an 8.57 pound kicker. 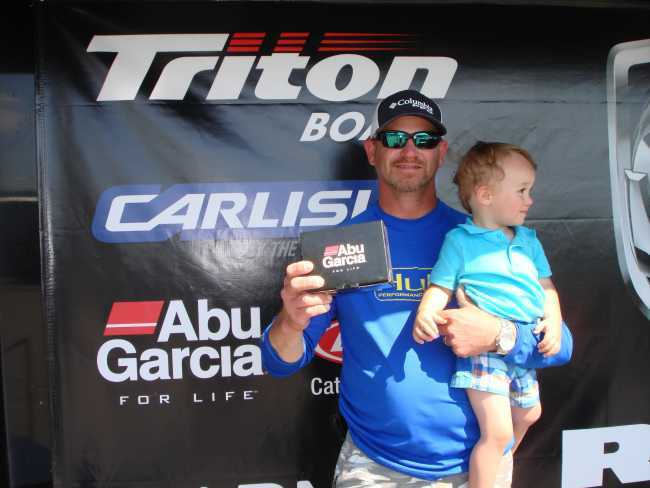 Attaway took home $5,000 for his efforts today as well as a $500 from Mercury Marine. Attaway also took $350 for catching the big bass on the boater side as well as a new Abu Garcia Revo XS for catching the biggest fish of the event while using an ABU Garcia reel. John Simonof of Jacksonville, AR won the Oklahoma Division Ram Truck Open Series event at Lake Eufaula on May 14, 2016 with 21.50 pounds. 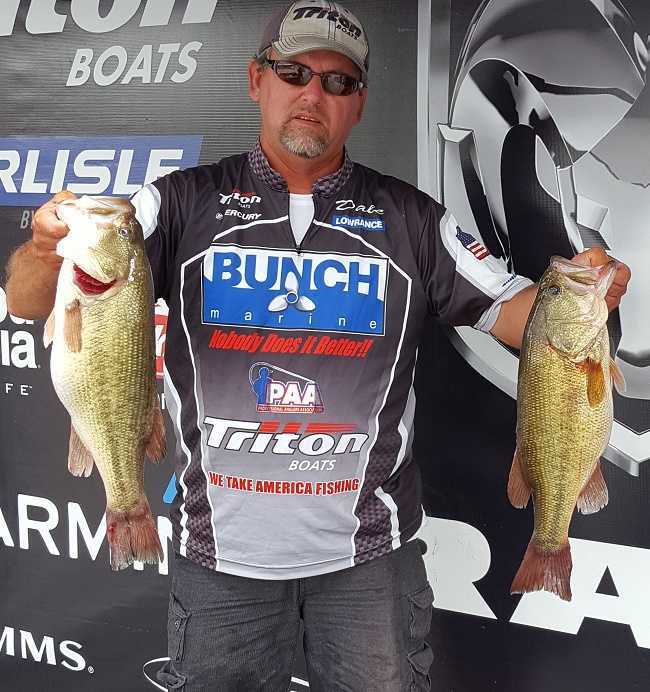 John also won the Lake Eufaula event in 2015. 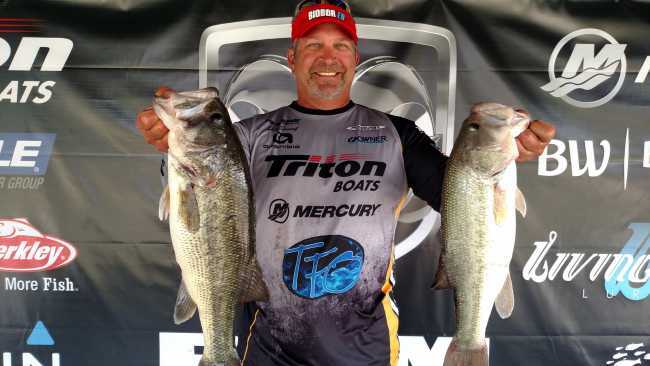 “Lake Eufaula has been good to me over the past few years,” said Simonof. “I went through nine keepers on the day fishing a Strike King 2.5 squarebill with Owner Precision Point Placement Treble Hooks fished on a 7’ 3” Temple Fork Outfitters medium light rod, Lew’s Speed Spool and #12 Hi-Seas Quattro Fluorocarbon line and a homemade 3/8 ounce bladed jig poured on an Owner Jig Hook fished on a 7’ 3” Temple Fork Outfitters heavy action rod, Lew’s Speed Spool, and #20 Hi-Seas Quattro fluorocarbon line.” “I rotated through three chunk rock areas that had an abundance of shad.” John indicated he had a decent limit by mid-morning and made three big upgrades after the sun came out in the afternoon by concentrating on the shady sides of deeper rocks. John won $5000 for his first place finish. Norm Attaway of Clearwater, SC won the Abu Garcia Revo Big Bass Bonus after using an Abu Garcia reel to catch his 9.95 pound Big Bass at the May 7, 2016 Ram Truck Open Series event at Lake Chickamauga. He was awarded an Abu Garcia Revo SX reel valued at $159.99. Tim Wyatt of Crossville, TN won the Tennessee East division Ram Truck Open Series event at Lake Chickamauga on May 7, 2016. Wyatt weighed in a 24.57 pound limit to win $5000. “I fished down on the lower end all day and only fished about five spots. Most of my bigger ones came from one spot. I was using a jig in 18-20 feet of water,” said Wyatt. Dale Pelfrey of Rockwood, TN won the Tennessee East Division Ram Truck Open Series opener at Lake Guntersville on February 6, 2015. Pelfrey caught a 28.47 pound sack of Guntersville bass to win $5000. “I caught all my fish using a green pumpkin jig with a Rage Craw as the trailer. We caught fish all day. It was a slow grind. We caught about 20 fish between the two of us. We had bites just every 30 minutes to an hour, rotating between two spots. It was not a very good execution day, I lost two good fish,” said Pelfrey. 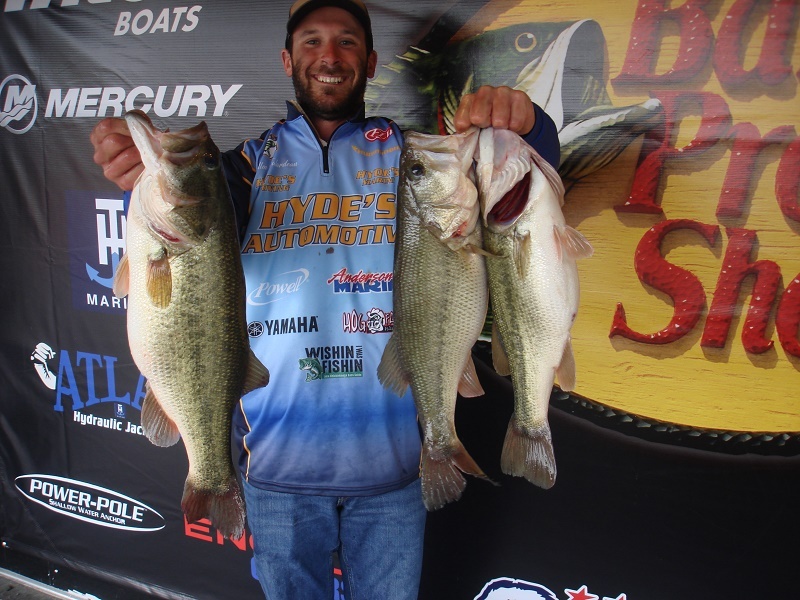 Derek Remitz of Grant, AL finished in second place with 18.15 pounds to earn a check for $1158. “I caught my fish using a Chatterbait running pockets looking for cleaner water. Since the lake was muddy, I just kept trying different things. I caught about 10 keepers all day. It was slow and I would catch 2-3 fish and then go a few hours without catching fish,” said Remitz. The third place spot went to Brian Hatfield of Spring City, TN with 17.26 pounds winning $772. “I was using a Livingston Howeller crankbait and a gold and black Jackal jerkbait all day. I was fishing in 8-10 feet of water, targeting rocks and bridges. It was slow all day, I did not catch my fish until the last 30 minutes of the day,” said Hatfield. Joseph Yocum of Knoxville, TN was the co-angler champion of the Ram Truck Open Series event held on February 6, 2016 at Lake Guntersville. Yocum’s 12.61 pound limit was worth $1565. “I caught my fish using a brown jig. I caught fish all day and had to cull a few times,” said Yocum. Brennon Binkley of Franklin, TN finished in second place on the co-angler side with 11.32 pounds to win $528. “I caught my fish on a red Rat-L-Trap. I never put the bait down. I had to cull a few times and caught fish throughout the day,” said Binkley. 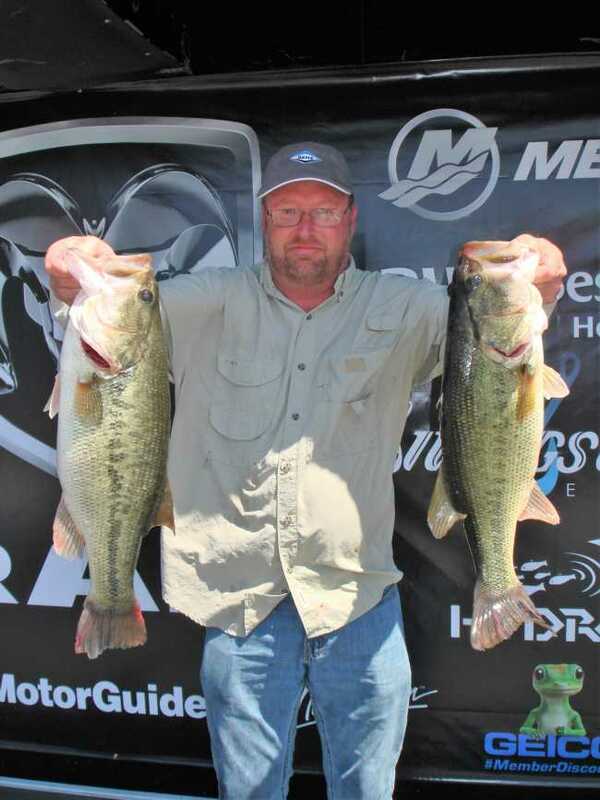 Roderick Green of Hulbert, OK brought in 10.06 pounds to finish in third place and win $351. Green also had the 5.78 pound Co-angler Big Bass to win $180 from the Big Bass Pot. “I used a rattling bait in chartreuse color. I caught my fish in shallow water all day,” said Green. 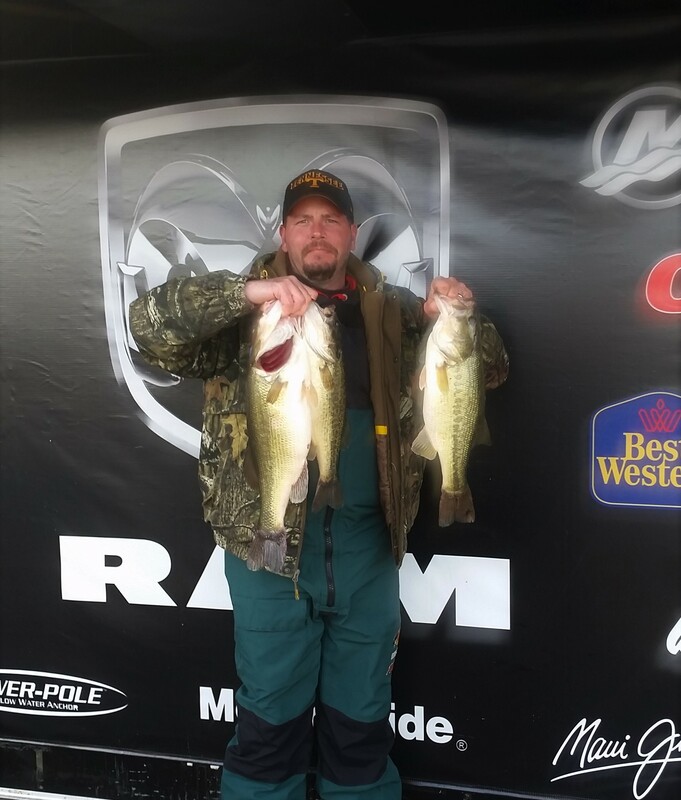 Greg D. Lamb of Harrison, TN won the Tennessee East Division Ram Weekend Bass Series Two-Day Championship at Lake Chickamauga on October 10-11, 2015. Lamb weighed in a two-day total of 29.83 pounds to take home $1050 and $300 from the High Stakes Option Pot. "I threw a frog both days. All ten fish that I weighed in were caught on a frog. I caught my better fish after 2:00 when the sun got up good. It's been a grind both days. Yesterday, I probably had 50 bites, but you don't always catch those 50 bites. I, actually, only had five keepers yesterday and I had seven keepers today. It's been a tough tournament, but it was all just mats with a frog. I did run around a good bit, but the majority of the fish came from south of Dayton Boat Dock," said Lamb. George I. Wells IV of Knoxville, TN brought in the Boater Big Bass weighing 5.38 pounds to win the $140 from the Big Bass Pot. "I caught the Big Bass around noon today on a Chatterbait," said Wells. Hermilo Salgado of Barberville, KY won the Tennessee East Division RAM Weekend Bass Series event at Lake Guntersville on August 1st, 2015. Salgado weighed in a total of 20.19 pounds to win $1558 for first place and $375 from the High Stakes Option Pot. "I had a pretty good and pretty bad day. My motor tore up and I decided to stay right around here. I started with a Chatter Bait and didn't do any good so I picked my buzzbait up. It was windy and I didn't expect to get a bite. As soon as I picked it up, it was like boom, one, two, and three. I was just lucky. My biggest fish came around mid-day," said Salgado. 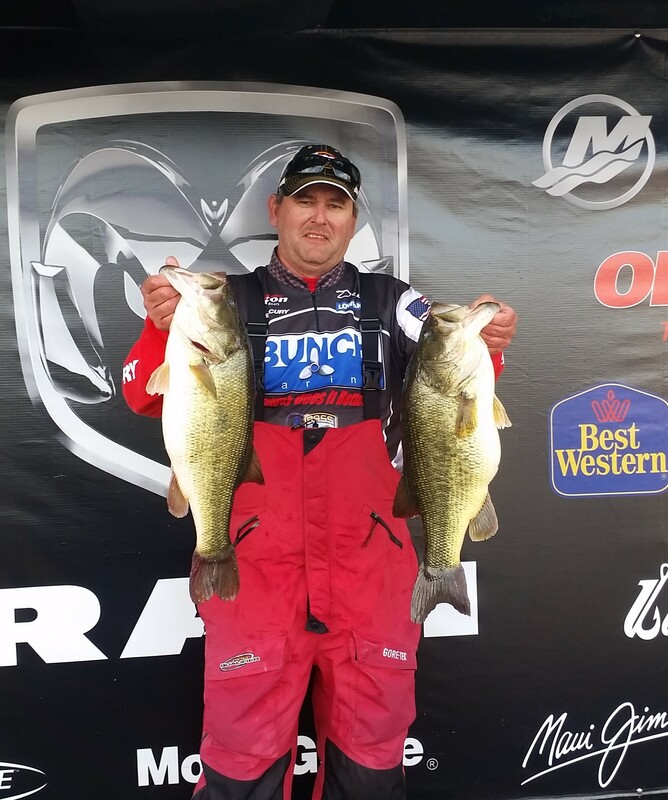 Edward Gettys of Buchanan, TN finished in second place with 20.08 pounds winning $791. "I caught them all on a jig in about 8-10 feet. My biggest problem was that I couldn't get any bigger than two to four pounds. I had to weigh in little bitty ones," said Gettys. Edward C. Letson of Knoxville, TN finished in third place with 19.66 pounds winning $536 and $175 from the High Stakes Option Pot. Letson used a Shakey Head and a Carolina rig from mid-lake south. Jack Dunaway of Kingston, TN brought in the boater Big Bass weighing 6.32 pounds to win $200 from the Big Bass Pot and $383 for fourth place. Dunaway caught his Big Bass around 7:00 am in about two feet of water using a Randy crankbait. Trent Wright of Scottsboro, AL was the co-angler champion of the event with 14.49 pounds and the 7.02 pound Big Bass winning $753 for first place, $95 for Big Bass, and $175 from the High Stakes Option Pot. Wright used an Abu Garcia reel to catch his Big Bass and he was awarded a new Abu Garcia Revo XS reel valued at $159.99 from the Abu Garcia Revo Big Bass Bonus. "We were on the lower end. If it wasn't for my boater, Mark McCaig, I wouldn't have caught the Big Bass. I flipped into a mat while he was culling. The fish thumped it and I set the hook. I fought the fish for about 60 seconds in the mat and almost broke my rod trying to get the fish out. She finally came up still in the mat and Mark netted her on the side of the mat. It's not every day you get to go out and catch a seven pounder," said Wright. Paul E. Palmer of Madisonville, TN finished in second place on the co-angler side with 8.08 pounds winning $384. "We were fishing up the river and I caught them all on a topwater popper," said Palmer. Jared Sullivan of Hixson, TN finished in third place co-angler side with 7.65 pounds winning $260 and $75 from the High Stakes Option Pot. "We went down lake. I caught one on a Wobble Head and a couple on a Shakey Head," said Sullivan. Complete result can be found at this link. Norm Attaway of Clearwater, SC won the Tennessee East Division RAM Weekend Bass Series event Lake Chickamauga on July 18th, 2015. Attaway weighed in a total of 16.73 pounds to win $1507 for first place and $350 from the High Stakes Option Pot. "I caught some fish this morning, but they were all small. The son got really high and I started flipping shallow hydrilla. I've tried to catch them out deep, but I'm not from here and there was a boat on every spot that looked like an obvious place for deep fish, so I looked for some places in between," said Attaway. Greg Shaver of Dayton, TN finished in second place with 16.25 pounds winning $768. "I was fishing the upper end of the lake and I caught most of my fish on a jig and a worm," said Shaver. Jeff A. Knight of Cleveland, TN finished in third place with 14.78 pounds winning $520 and $120 from the High Stakes Option Pot. "I went up to Hiwassee and stayed there all day," said Knight. James "Andy" of Parkinson of Dalton, GA brought in the boater Big Bass weighing 8.36 pounds to win $210 from the Big Bass Pot and $373 for fourth place. "It was late in the day and I was around the mid-lake area when I caught the Big Bass. I had been offshore, but the offshore bite has been tough lately. Those fish are just really beat up. I moved over to a cove and flipped up under a dock and caught her. It was the only bite I got in there," said Parkinson. Toby Steele of Ten Mile, TN was the co-angler champion of the event with 10.86 pounds winning $685 for first place and $175 from the High Stakes Option Pot. Steele use a Wobble Head, a Biffle Bug, and a jig. "It was just one here and one there throughout the day. I was just fortunate that I got four good bites and was able to cull one of them," said Steele. Jared Sullivan of Hixson, TN finished in second place on the co-angler side with 10.85 pounds winning $345 for second place and $75 from the High Stakes Option Pot. "It was a later bite on some deeper fish for us," said Sullivan. Russell ""Jake" Jacobson of Lenoir City, TN and Frank Lillig of Acworth, GA tied for the third place co-angler spot with 8.27 pounds winning $203 each. "I caught my two biggest ones on a Strike King 6XD crankbait around mid-lake in deeper water. It was a good time and I really enjoyed it,” said Jacobson. "We fished toward the south end and we both ended up throwing a 1/2 ounce green pumpkin jig with a Strike King Rage Craw trailer. It was a really light bite and the fish would just barely pick it up. With my St. Croix Avid X rod, I could feel the fish pick it up," said Lillig. William "Lucas" Neal of Harriman, TN brought in the co-angler Big Bass of the tournament weighing 7.98 pounds. Haden Lamb of Birchwood, TN won the Tennessee East Division RAM Weekend Bass Series event at Lake Chickamauga on June 20th, 2015. Lamb weighed in a total of 21.79 pounds to win $1745. "I mainly fished the main lake region and fished a lot of different water depths. The main key was the top of ledges in 12-14 feet. I fished the grass and caught a few, but the main thing was the tops of the ledges right on the break. The wind hurt today with waves crashing over the bow of the boat. It was brutal," said Lamb. 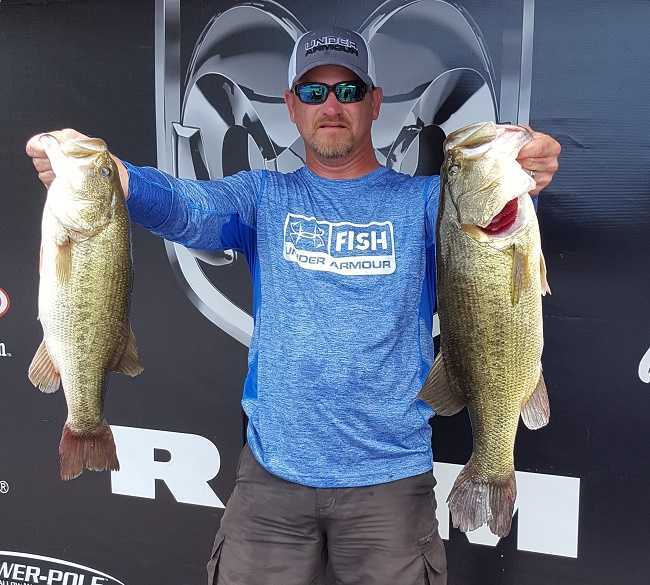 Rogne Brown of Hixson, TN finished in second place with 21.57 pounds winning $886 and $450 from the High Stakes Option Pot. "I started down lake. The first place I came to that I wanted to fish, it was pouring down rain and I caught my biggest fish of the day. I caught three of the fish that I weighed in on a jig and the other two on a swimbait. I caught quite a few fish today and lost one big one. That's just the way it goes," said Brown. Jeff A. Knight of Cleveland, TN finished in third place with 20.88 pounds winning $600 and $250 from the High Stakes Option Pot. "I lost a five pounder on the first cast of the morning and another five pounder on the third cast. I was fishing up in Hiwassee and stayed there all day. It was protected from the wind by the mountain so I could flip the trees and stuff on the south side without a problem," said Knight. Rod Huff of Monterey, TN brought in the boater Big Bass weighing 7.29 pounds to win $260 from the Big Bass Pot. "I caught the Big Bass in the middle of the day on a jig in about 12-14 feet of water," said Monterey. Paul E. Palmer of Madisonville, TN was the co-angler champion of the event with 12.39 pounds. Palmer won $779. "We fished mid-lake down and the wind was horrible for me. I caught my fish on a worm and a couple on a crankbait," said Palmer. Roy Yother of Red Bank, TN finished in second place on the co-angler side with 11.11 pounds and the co-angler Big Bass weighing 5.43 pounds to win $360 for second place, $125 from the Big Bass Pot, and $225 from the High Stakes Option Pot. "We fished mid-river. I caught most of my fish on a Carolina rig early. About 1:00 the wind got so bad that we had to go to the deep banks and flipped out a couple of good fish. That's where the Big Bass came from on a jig," said Yother. Jared Sullivan of Hixson TN was the third place co-angler with 9.62 pounds winning $268 and $125 from the High Stakes Option Pot. "We were fishing above the Route 60 bridge almost all day and the first fish came on a crankbait. Then I was able to get a couple of culls with a drop shot," Sullivan.